The Vernier Magnetic Field Sensor measures a vector component of the magnetic field near the sensor tip. The tip can be adjusted, allowing the user to measure fields that are parallel or perpendicular to the long axis of the sensor. The Magnetic Field Sensor can be used for a variety of interesting experiments involving magnetic fields. Measure and study the Earth’s magnetic field. Determine the direction of magnetic north. 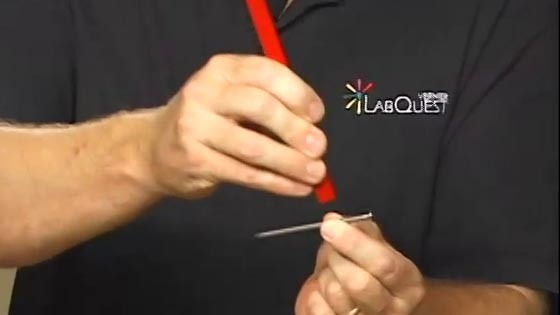 Study the magnetic field near a permanent magnet. Measure the field near a current-carrying wire. Measure the field at the opening of a solenoid. The Magnetic Field Sensor may require a compatible interface and software. Choose a platform below to see compatible interface and software options. The Magnetic Field Sensor is fully supported with LabQuest 2 (version 2.8.5), a standalone data logger with built-in graphing and analysis software. The software will identify the sensor and load a default data-collection setup. You are now ready to collect data. Use the switch on the sensor shaft to select an appropriate range. The 6.4 mT range is used to measure relatively strong magnetic fields around permanent magnets and electromagnets. The 0.32 mT range is used mainly to measure the magnetic field of the Earth and very weak fields. It can be used for other magnets, but the sensor must remain in one position so that the reading is not affected by the background field of the Earth. In this project, you will design and build a mobile robot to replicate a migrating animal. Your robot should be able to start from any initial position, rotate around to orient itself in a northward-facing direction, and then move forward for approximately one meter. 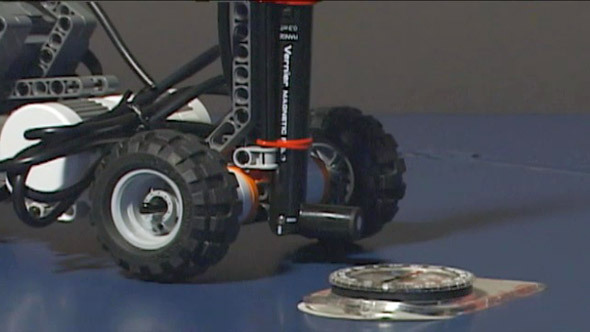 In this project, you will design and build a mobile robot for pinpointing the location of a hidden magnet. Use a Magnetic Field Sensor to quantify the magnetic field strength of induced magnets. You should not have to perform a new calibration when using the Magnetic Field Sensor. We have set the sensor to match our stored calibration before shipping it. It is not practical to calibrate the Magnetic Field Sensor without reference to a known source of magnetic field. It is useful, however, to zero the Magnetic Field Sensor. Position the sensor and zero it using your data-collection software. Move the magnetic field source, and not the sensor, to explore the spatial variations of the field. Moving the sensor will upset the zero since the background magnetic field in your lab probably varies with position. For experiments measuring the spatial variation of a magnetic field, it is better to zero the sensor and then move the source to various positions. The sensor uses a Hall-effect transducer. It produces a voltage that is linear with magnetic field. The sensor measures the component of the magnetic field that is perpendicular to the white dot on the end of the sensor tip. The reading is positive when the white dot on the sensor points toward a magnetic south pole. The switch on the sensor shaft is used to select the range. On the 6.4 mT range, each volt measured by the transducer represents 32 gauss (3.2 × 10-3 tesla). The range of the sensor is ±64 gauss or ±6.4 × 10-3 tesla. On the 0.3 mT range, each volt measured represents 1.6 gauss (1.6 × 10-4 tesla). The range of the sensor is ±3.2 gauss or ±3.2 × 10-4 tesla. If the sensor tube is held vertically with the tip horizontal, and rotated until the maximum voltage is found, the tip with the white dot will point to magnetic north. The magnetic inclination in your area can be found by holding the tube so that the white dot is facing north, and rotating the sensor end of the tube down until the voltage reaches a maximum. The angle of the tip from the vertical position is the magnetic inclination. Note that the north pole of a freely suspended magnet points north, since the magnetic pole of the Earth in the northern hemisphere is a south magnetic pole. If you are getting unexpected or unusual readings from the Magnetic Field Sensor, first confirm that the range setting is appropriate for the experiment. The ±6.4 mT range is used to measure relatively strong magnetic fields around permanent magnets and electromagnets; the ±0.32 mT range is used to measure the magnetic field of the Earth and very weak fields. If you are using the ±0.32 mT range for investigating permanent magnets, make sure that the sensor remains in one position so that the reading is not affected by the background field of the Earth. 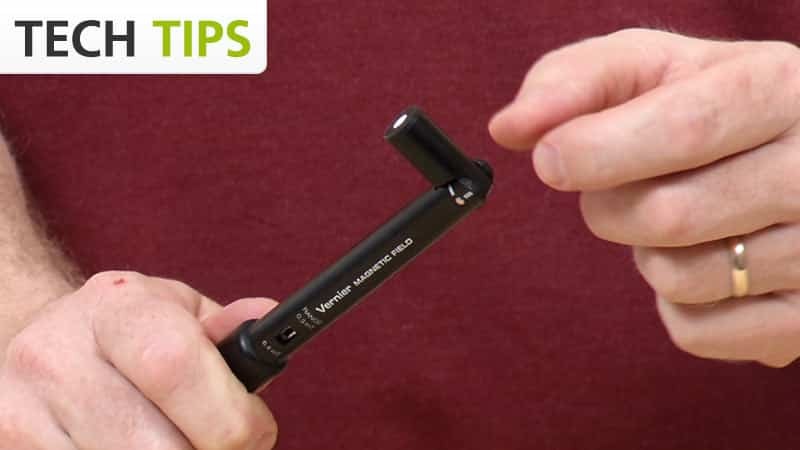 If you have watched the related product video(s), followed the troubleshooting steps, and are still having trouble with your Magnetic Field Sensor, contact Vernier Technical Support at support@vernier.com or call 888-837-6437. Support specialists will work with you to determine if the unit needs to be sent in for repair. At that time, a Return Merchandise Authorization (RMA) number will be issued and instructions will be communicated on how to return the unit for repair.